My husband and I were married in the Fall of 2011, and like most new brides, I desperately… [DESPERATE]ly wanted to please him. That’s not to say I still don’t desire to do so, there’s just a certain…pressure…we brides put on ourselves at the beginning of marriage (can I get a witness!?) It’s the type of pressure that says anything less than Martha Stewart is considered failure. Stepping into the office of SPOUSE is like stepping into your mother’s high heels in the beginning; far too big and very VERY awkward. And “awkward” was a good description of my cooking style at the beginning as well. Let’s just say my arsenal consisted heavily of tuna…pasta..the occasional lemon pepper chicken (if I was feeling wild)…and Stouffer’s lasagna. And then a few months into marriage I, along with the rest of the known world, discovered the wonderful world of the Spaghetti Squash. My tastebuds first sang of its praises at my friend Rebecca’s 30th birthday dinner, and I had vowed to try my hand at it ever since. So imagine my delight when one night, at our local Trader Joe’s, there it was on display basically beckoning me to buy it. 1. Microwave squash for 2-3 minutes to soften the skin…CHECK! …annnnd this is where it got a little tricky…It took me 20 minutes just to cut the dang thing open. 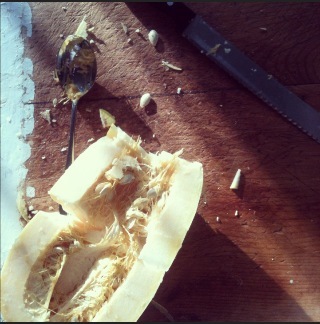 Not to mention my poor squash lost 1/2 of his body in the process. But I didn’t let this deter me! I was on a roll! 3. Season and place face down in a microwavable dish with 1/2 inch of water…CHECK! 4. Microwave for 10 minutes…CHECK! 5. Let cool and then begin to scrape the body length wise to make your “spaghetti”….Uhhh Check…? See, this is where I should have listened to my instincts. I ignored said instincts, added a bit of butter, some spaghetti sauce, a little parmesan cheese and…Voila! Dinner was served. Robert couldn’t contain it, he snorted so loud mid crunch the tiny bits of spaghetti squash flew across the table and landed on my plate. 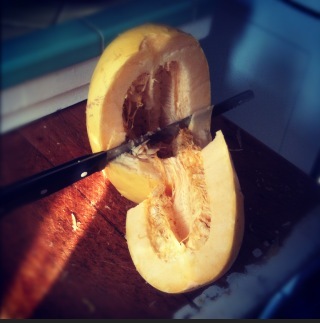 My spaghetti squash was still TOTALLY RAW…yet slightly warm. GROSS. But Robert, being the sensitive and caring man that he is still finished off the entire plate, and even asked me for seconds. (Brownie points). 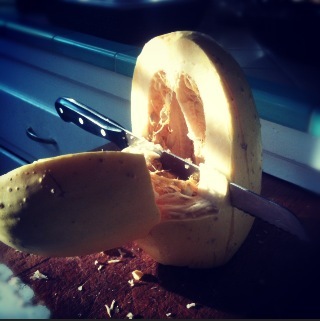 Needless to say, my first attempt at Spaghetti Squash was a total flop…and by flop, I mean disgusting. But over the years, as my skill sets have grown and I have tried my hand at a few other Spaghetti Squash recipes, I feel confident that I have finally found a recipe I can stand behind.